Red barn in, 20" x 30" signed. 26.5" x 32.5" in the frame. bio from ask art.com George W. Drew was born 21 December 1875 in Massachusetts. He was a member of the Independent Artists Association. He exhibited at the National Academy of Design and they have him recorded as living at 745 Columbus Ave., N.Y. in the year 1898. He also exhibited at the Allied Artists of America, which was established in 1914, Salons of America, N.Y. State Fair, Newark State Fair, Newark Museum and New York Museum of Science & Industry. 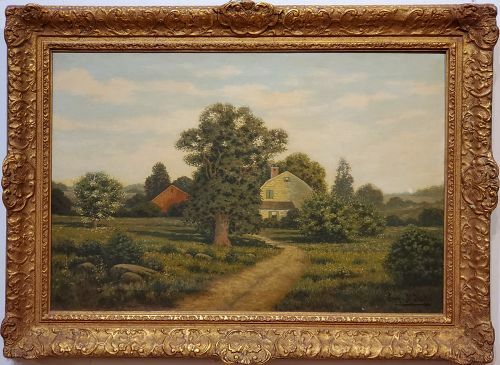 Although there is little known about the personal life of George W. Drew, his paintings appear on the art market quite often. It is obvious that his work has always been well received because of the numerous exhibitions he has participated in. He is known for his rustic luminous depictions of the Nineteenth Century American Landscape. Like many of the Hudson River Painters, Drew captures the effects of light from within the canvas. He is a master of perspective; his landscapes are classically and harmoniously balanced, leaving the viewer to gently rest their eyes on the rustic countryside.